Share the post "Album review: HUDSON FORD – The A&M Albums"
Vocalist, guitarist and bassist John Ford and drummer Richard Hudson were originally members of Elmer Gantry’s Velvet Opera in the 60s, before famously joining The Strawbs (a band that at one point featured Rick Wakeman). 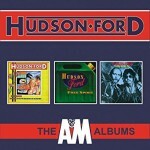 In the early 70s they formed Hudson Ford, with Richard switching to guitar and vocals. Their 3 A&M albums, released 1973, ‘74 and ’75 respectively, are issued here in card sleeves, the box completing the package with a very detailed booklet. 1973’s Nickelodeon saw the rock duo expanded with keyboard player Chris Parren, guitarist Mickey Keen and drummer Gerry Conway. There’s a classic rock sound to opener Crying Blues, and it’s easy to see the instant appeal. There’s a hint of West Coast country rock to Angels, then there’s a hint of The Beatles to I Wanted To Say, the vocal harmonies and strings add to that sound. There are some commercial touches in the album that, for all its retro influences, sat very nicely in the mid 70s. It also featured session musicians including Rick Wakeman. The following year’s Free Spirit, with Ken Laws replacing drummer Conway, kicked off in a fine and funky rock/pop style. There’s some outstanding guitar on the opening track Take A Little Word, and the piano break shines too. A few songs enter the 6-8 minute range that allows as much expansion as experimentation, and there as many progressive undertones as there are pop overtones. With guitarist Mick Clarke coming in for 1975’s World’s Collide, replacing Mickey Keen, we get a solid and much brighter affair. A more contemporary feel, the keyboards give a more modern feel. Producer Tom Allom lends a keyboards hand too. This album was a little change in direction by the most professional and consistent sounding. Not only is it a well presented package, but each disc comes with bonus tracks and the booklet, full of photos, is annotated by the Strawbs’ website editor – someone who actually knows what they’re talking about. The band spit in 1977, and the duo famously resurfaced as The Monks a couple of years later, before work with Strawbs reunions beckoned. This entry was posted in ALBUM REVIEWS, ALBUM REVIEWS (Mobile), All Posts, Reissues and tagged A&M Albums, album, Hudson Ford, reissue, review, Rick Wakeman, the Monks, The Strawbs. Bookmark the permalink.